Strawberry shortcake gets a chocolate twist. 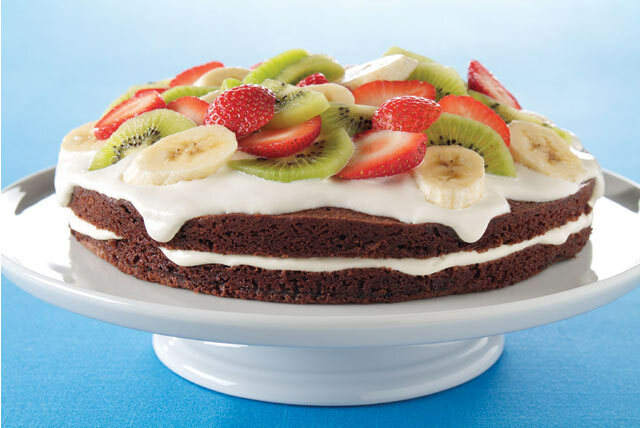 Moist chocolate brownie layers, creamy filling and chopped fruit create a new version of a classic dessert. Prepare brownie batter as directed on package; stir in 1/2 cup sour cream. Spoon into 9-inch round pan sprayed with cooking spray. Bake 45 min. ; cool in pan 10 min. Remove from pan to wire rack; cool completely. Mix remaining sour cream, Cool Whip, sugar and vanilla. Cut brownie horizontally in half. Stack layers on plate, filling with half the Cool Whip mixture. Top with remaining Cool Whip mixture and fruit. Prepare using 3 cups of your favourite seasonal fresh fruit.